In this part, C# users will have an overview of usages of view tabs on HTML5 PDF Viewer. PDF file is loaded as sample file for viewing on the viewer. See screeshot as below. Select text and image on PDF document. Click to go to the first page of PDF. Click to go to previous PDF page. Go to any selected page of PDF. Click to go to next page. Click to go to the end page of PDF document. View PDF in single page display mode. 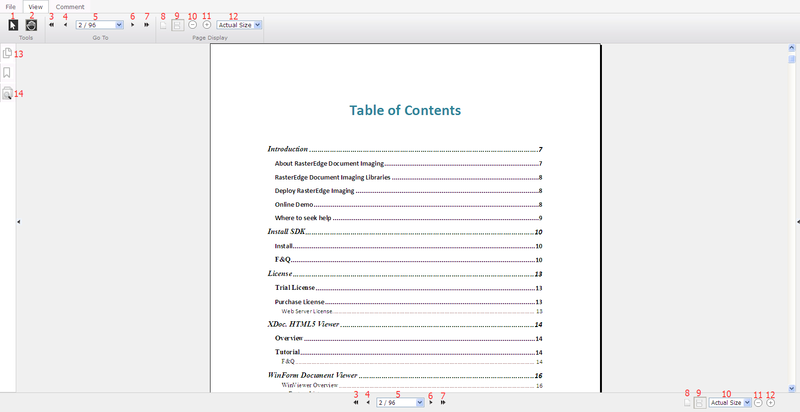 View PDF document in continuous pages display mode. Click to zoom out current PDF document page. Click to zoom in current PDF document page. Click to select a value to zoom in or zoom out PDF document page. Navigate PDF document with thumbnails.